Eight friends of North Beach Park gathered Saturday (6/28) morning to help restore this neighborhood pocket of our urban forest. This month, we concentrated on aftercare, weeding and watering plants that had been planted in the last year or two. Generally, restoration plants are left to sink or swim on their own. But even a little water in their first year or two can be very helpful in getting them fully established to survive the summer droughts. We concentrated on the rim of the park, along 24th Ave., and along the upland side of the first couple hundred feet of the main trail. 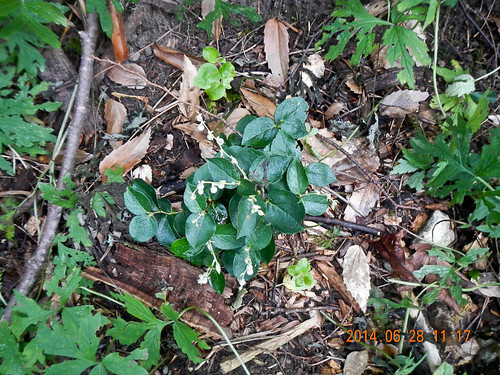 This salal is looking pretty good. Salal takes a while to establish, but can really take off after a few years. The fact that it has flowers is a good sign. Overall, it was a pretty easy going work party. The people who brought wheelbarrows of water up from the stream, or the people who brought the tires up from the wetlands, might disagree with me. ;> But I do know a good time was had by all. As always, there are a few more photos on Flickr. There is a lot happening in the park this summer, restoration-wise. We’ve already had a visit from SPU, a drainage specialist and a wetland scientist, to talk about our wetlands and what we can do (they were favorably impressed, and made some good suggestions). Monday, June 30, we’re going to do a cross-gradient transect of the park, examining plant life and restoration issues in detail along a nearly 700 foot line. We’ll be working with Stewart Wechsler. In early July, we’ll have a visit with a person from King Conservation District, who will help us plan some outreach and financing (through grants) larger projects in the park. And in July and August, I (Luke) will be working on a restoration management plan for the park. A lot of the information provided by the site reviews and transect will be used in the management plan. 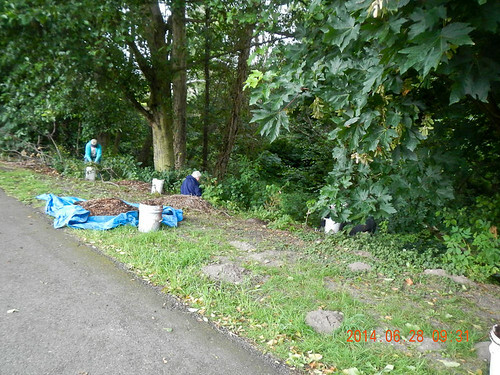 Our next work party is July 26th, 9 a.m. to noon. We’ll meet at the main entrance to the park, 90th St. and 24th Ave NW. Wear weather-appropriate layers and sturdy shoes that can get dirty, bring water or a snack if you need it. We’ll provide tools, gloves, and guidance. Join us and find out how much fun it is to help restore our forested parks.